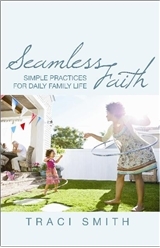 When I teach parents how to incorporate spiritual practice into their family routine, I stress this truth: Faith is learned when it’s woven seamlessly into the fabric of our everyday lives. The idea is that faith practices that have lasting impact are incorporated into daily life effortlessly. Of course, things that appear effortless in our lives are often things that we’ve nurtured through deliberate practice and patience. I’m committed to helping families develop meaningful faith practices at home that help deepen faith–not just for children, but for the whole family. As Christian educators, we often want to help bridge the gap between church and home, but we don’t know where to start. Here are a few principles that I find useful to teach parents. These principles will inspire confidence in the families of your congregation and help them to realize that with a little effort they will be able to help their children connect faith to many aspects of daily living. Keep It Simple, Yet Consistent: Most of the traditions, ceremonies, and spiritual practices that I teach to families can be completed in less than 5 minutes. Nearly 90% of them can be completed in less than an hour. One way to make small time commitments reap greater rewards is through consistency. Offer a blessing every evening, a service opportunity every Lent, candles every Advent. Over time, these small and consistent actions build a solid foundation of faith. Start with Gratitude: Families often ask me where to start, and I always say “start with gratitude.” Numerous scientific studies celebrate the physical and emotional benefits of gratitude. Simply training your family to list, once a week, five things each person is grateful will change your family’s spiritual health for the better. Families can use gratitude jars, journals, or set up their own tradition for celebrating life’s blessings. Decry Perfectionism: Social media sites like Pinterest and Facebook give a sanitized and airbrushed perspective on what it’s like to live together as a family. It’s easy for families to feel inadequate and burned out. When families try to incorporate spiritual practices into their daily lives, some will go well and others will be spectacular failures. The key is to maintain a spirit of resilience and commitment to trying again. Insist on Attendance, but Be Flexible about Participation: How to deal with children who are old enough to roll their eyes at family activities? I believe balance is key. Insisting that children participate even when they don’t want to sometimes creates an environment where resentment and anger can grow. On the other hand, making spiritual development optional to family life goes too far in the opposite direction. I encourage families to insist all family members be present for family faith activities but give the option to observe quietly. Trust your Level of Knowledge and Competence: “Yes, but I’m not a pastor; I didn’t go to seminary like you did.” Oh how often I have heard those words! No parent would refuse to teach her child to throw a baseball just because she wasn’t a professional. No parent says, “No lunch for you–I’m not a chef.” We make do with what we have. We know our children need to learn to play and eat, and so we learn to throw balls and cook food. The same is true for spiritual practices. It might be difficult at first, but we can get better with time. Piggy-Back on Existing Opportunities: Nighttime routines, the death of a pet, the first day of school, Thanksgiving, a new driver’s license, looking at the stars in the sky–each of these is an opportunity to circle around to faith. In my book Seamless Faith you’ll find activities based around each of these pre-existing opportunities. Check it out for ideas, or create your own. The following example from Seamless Faith, chapter 6, may get your brain moving. It’s called the “Ignatian Examen” for families. The Ignatian Examen is a way of praying that has been practiced for centuries. Ignatius, one of the early church patriarchs, proposed the Examen as a way of reflecting on one’s day and growing closer to God. This variation is modified for families as an activity that can be done in the car or at dinnertime. What are a few memorable things that happened today? When was the time when you saw or felt close to God today, or saw God at work today? When was the time when you felt farthest from God today, or felt that you missed an opportunity to share God’s love? Questions are handled one at a time. As each family member shares, the other family members listen without comment or interruption. If, after prompting, a child still says “no,” participation in the family Examen time should not be forced. Families might choose to require that all members stay present at the table and listen respectfully, but those who do not wish to share aloud can be encouraged to think about their answers in silence. This exercise differs from other family discussions or reflection times in that it is not a back-and-forth type of conversation. Family members do not offer commentary or follow-up questions. Follow-up can happen away from the table, if necessary. Alternate who shares on which days. Some families may enjoy doing this practice every day; others might pick a specific day of the week to do it or to include it as a part of the Sacred Meal (also in this chapter). Allow family members to hear the questions one at a time and reflect on their own answers silently, or in a journal, rather than sharing them with the rest of the family. Copyright Traci Smith, published by Chalice Press, 2014. Used by permission.